Should education leaders work openly? Is knowledge more rapidly mobilized through the system when leaders work openly? 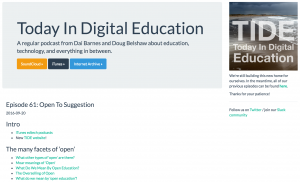 For the purposes of my work, I am considering personal professional openness – the concept of sharing thinking and learning in open spaces, curating resources for others, engaging in open conversations in text or through broadcast technologies like podcasts, videos and YouTube Live, blogging and commenting on blogs, and participating across the educational boundaries in wider conversations across the web. “Working open” means different things in different contexts. Doug Belshaw has summarized the idea of working open in education here. Here is a summary of what I learned this week. The full story is below. Working openly is a new skill, with unlimited potential for mobilizing knowledge within the education system. We (as a system) don’t yet value it as a critical leadership skill for education. Open practices are on a continuum, and are dependent on context. Developing digital literacies helps leaders understand what should be shared openly, but also what should be shared behind a password, and what should be private. Senior Leaders need to be conscious of their position when blogging, but sharing their learning minimizes the disconnect between leadership thinking and classroom practice. Once Senior Leaders believe that open practice is worth pursuing, we need a scaffolded approach to help develop an understanding of digital literacies and support in developing that open practice. Open practice by senior leaders encourages the participation of the entire learning community, and helps all stakeholders in public education find their voice. 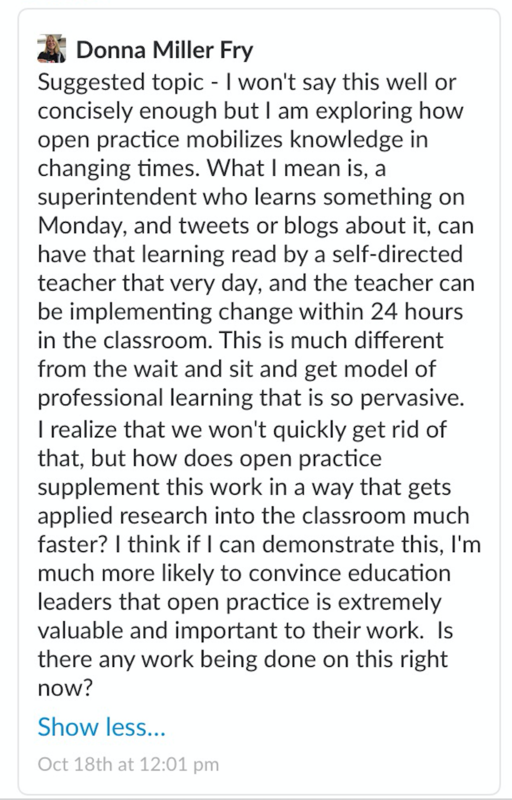 Since beginning my work with #mathleadersNEO the Mathematics Leadership Network, I have been exploring this thinking – how open practice can impact the work of education leaders, particularly in influencing classroom practice and improving student learning. 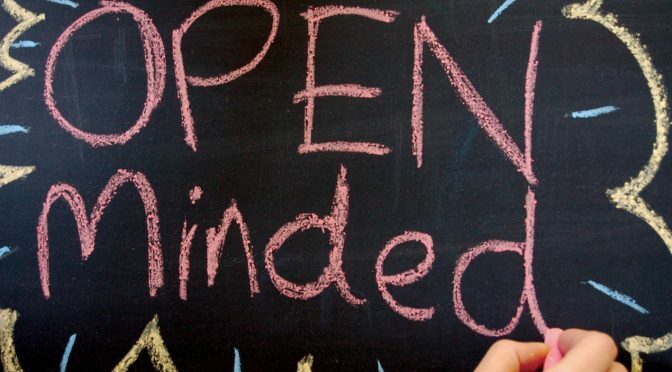 Recently, I listened to the TIDE Podcast #61: Open to Suggestion, which got me thinking again about the value in working openly as an education leaders. I was so pleased to see that in TIDE Episode #70, the answer to this question was discussed, and some ideas completely new to me surfaced in the conversation. I have posted the sections of the podcast to help provide focus for the thinking. Please take a few minutes to listen to the sound clips that are much more explicit than my summaries below. Dai began by talking about the role of an education leader and how conscious a leader needs to be about that role and position, and the ‘weight’ of the words they might make public. Understanding what can and should be shared openly is a digital literacy, and it takes time to build. Experiencing the value of reaching an audience this way, and leveraging it to achieve organizational goals, also takes time to develop. It is difficult to access education leaders. When they make their thinking and learning visible through blogging and other social media interactions, everyone in the organization (and the community) has access to what they are learning. Instead of sharing resources with specific educators in email, leaders can share them in an open space (such as a blog or website) so that all educators, within the system and world wide, have access to those resources. It also allows others to then comment on how they use the resources in classroom practice, to add other similar resources to the list, and to have a conversation in the comments around the specific learning goals best supported through these resources. What are the Barriers to Sharing Openly? We have to understand what can (and should) be shared fully openly, what should be shared behind a password, and what should be private. As well, we need to learn how to do that sharing so that nobody is personally or professionally impacted in a negative way. For example, sharing a screencast on how to copy a Google Doc might be valuable to many educators. What we wouldn’t say, is, “I know many educators in my school are struggling with this, so I have made this instructional screencast to help you”. We might say instead, “Are you trying to copy a Google Doc? Here are some simple instructions to walk you through the process”. This statement makes the learning open to all without any suggestion that the skill is one specific people find difficult. It’s new learning. It’s 2016 learning. And you don’t know what you don’t know. For so many educators, the way they have always done things has served them well and they don’t see the need for change in practice. What New Leadership Qualities do we Value in 2016? When, as a leader, you work openly, you allow others to “swim in the river you are swimming in”, not your river, but the one you are swimming in right now. Dai is playing with an important concept here, I think. There are certain qualities and strengths of education leaders that we have traditionally valued, and we look for these. But working openly is a new skill, with unlimited potential for mobilizing knowledge within the education system. We don’t yet value it in the education system. There is no such thing as open practice. It is open practices (plural) because it is always within the context of where the learning is happening. “You are never going to be able to shortcut doing the hard work of changing hearts and mind, and the hook which gets people to realize that working openly is useful, is going to be different in every situation”. Who can you influence to practice more openly today? What small steps can each leader take to work more openly? How can Superintendents ensure that knowledge and understanding of high-yield instructional practices reaches the level of the student desk? Does the exchange of ideas in open networks, across the boundaries of school districts, and even countries, more quickly impact change in classroom practice? Can open leadership practices by system leaders enhance knowledge mobilization and improved classroom instruction, thereby increasing student learning and achievement? Can technology help system leaders get new learning into classrooms? Please also see our work with Stephen Downes here. I am learning how to use Hypothes.is as a way to support #workingopen. It’s a tool that I am encouraging students to use so that they begin to learn how to collaborate online, to share their thinking, and to build knowledge together. All important parts of the skill set of #workingopen, I think. Here is the link for everyone and anyone to add their thoughts on this terrific post!